Following the recommendations of the 2013 Scientific Committee, the project was stopped. Black holes are certainly between the most fundamental objects of our universe as they can probe and possibly link some of the fundamental theories in physics. However today they can be observed and experimentally studied only in an astrophysical context through the specific effects they induce on matter and radiation that are sufficiently close to their horizon. The aim of the proposed project is to investigate the properties, the evolution history and the cosmic role of black holes through the study of the impact they have on their environment at different scales and at different cosmic times. In order to tackle this ambitious program we propose to focus the research project on the following four distinct topics. The so called “dark ages” of the universe began about 400.000 years after the Big Bang as matter cooled down and space became filled with neutral hydrogen for hundreds of millions years. How most of the matter in the universe became again ionized (re-ionized) and was re-heated over large volumes of space in less than a billon year is a question of topical interest in cosmology. Observational evidence exists for extensive star formation up to z ~ 8-10. The detection of the explosion of a massive star at z ~ 8.2 provides further evidence for the collapse of massive stars into black holes at these early epochs, producing a large population of high mass black hole x-ray binaries. We propose that the thermal (UV and soft x-rays) and non-thermal (hard x-rays, winds and jets) emission from this large population of stellar black hole high mass binaries heated the intergalactic medium over large volumes of space during the re-ionization era of the universe. Feedback from accreting stellar black holes at that epoch may have direct implications for models on the minimum mass required for the formation of dwarf galaxies and for existing and future atomic hydrogen radio surveys of HI in the early universe. We propose to study this feedback theoretically, and through intensive simulations. It is well known that all galaxies show a tight correlation between the mass of their central super-massive black hole and the velocity dispersion of the stars in their bulge. This proves that there is some form of feedback between the black hole growth and the galaxy evolution. The nature of this feedback however is not known and remains one of the crucial mysteries of modern astronomy. We intend to investigate the nature of the feedback, most probably relativistic particle ejectionsand/or plasma outflows, with the study of a selected sample of active galactic nuclei to be performed with the data of present high energy space telescopes as XMM, Integral, Fermi and Hess and future facilities like Astro-H. The super-massive black hole at the center of our own Galaxy, associated to the source Sgr A*, is extremely quiet at the present times, and characterizes the quiescent phase of the black holes in the galactic nuclei of the local universe. 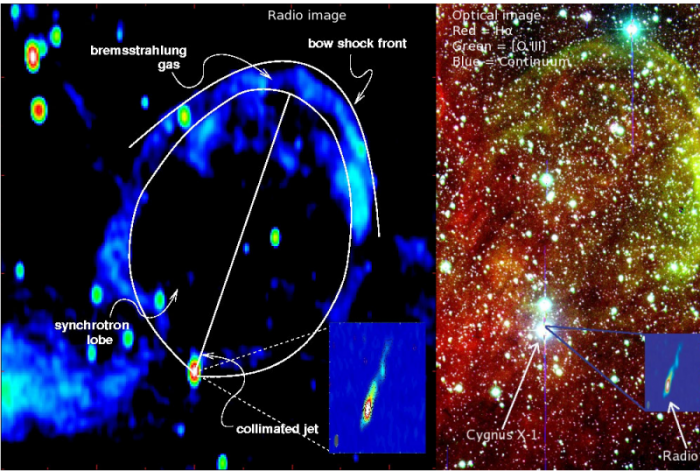 However our recent X-ray and gamma-ray observations (with XMM and Integral) of the molecular clouds of the central zone have shown that Sgr A* underwent a powerful outburst few hundred years ago during which its X-ray luminosity increased by a factor of over one million. This phase of activity lasted for about 400 years and left its imprint in the molecular clouds of the region that reflect this radiation towards us with a delay that depends on their spatial distribution around the center. The molecular cloud emission variations allow us to explore both the behavior of the black hole in the past and the very complex matter distribution in the central region. Such an active phase of the central black hole must have also induced variations in its complex interstellar environment. Evidences for such impact on the chemistry of clouds have been already found with observations of radio molecular lines such as those of SiO and HCO. We propose to open a new field of investigation in our laboratories, to be carried out in parallel to our large program of X-ray and gamma-ray observations of the Galactic Center, in order to study ionization, heating and chemistry changes of the surrounding interstellar matter (ISM) induced by the past activity of the supermassive black hole. The outcome of this study will also allow a better understanding of conditions in the central galactic region, important for the cosmic ray particle propagation and interaction. 1. Study of the nature and characteristics of the compact object of the binary system, which are modified by accretion and ejection of matter. 3. Study of the impact of microquasars on the ISM through the intense radiation, the relativistic jets or other outflows (e.g. bubbles of shocked ISM by relativistic ejections). We propose to carry out this collaborative work with the contribution of world-wide known experts who will be invited for long period stays (typically one year) and of young scientists at post-doc level that will be also selected for the complementary expertise they can provide to our present teams (simulations, ISM chemistry, radio data analysis). These experts and scientists will provide part of the initial expertise lacking in our laboratories, to develop the study of the re-ionization era, impact of extragalactic black holes and the Galactic Center environment. The first year will be dedicated to a theoretical, detailed description of the problems. Deeper investigations will be made possible then by extended simulations of the physical processes. 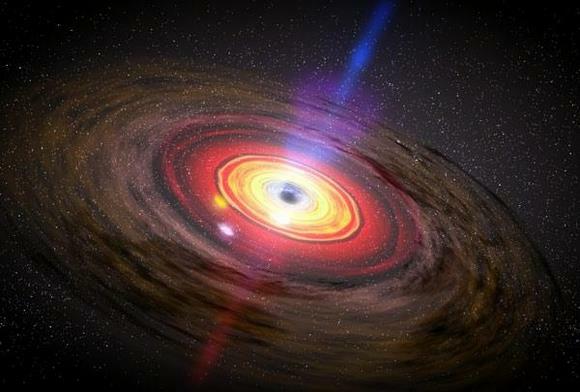 A continuous exchange between theory, simulations and available data will lead to a more detailed view of the impact of black holes on their environment. Precise observable quantities will be predicted, in order to test our study results with the present and next generation telescopes. This project will allow us to prepare the future radio, infrared and X-ray observations which our laboratories will carry out in the future with the next generation of telescopes. This project will open new area of interdisciplinary studies in high energy astrophysics but will build up on the strong expertise that APC and AIM teams have in the field of microquasars, jets, AGNs and galactic center physics and on their already existing research programs. This project will optimize the scientific return of present and future X and gamma ray missions in which the two laboratories are involved. Two years of exploratory study supported by visiting senior scientists will allow focusing the project on two of the items mentioned above, that will then be covered with 3 years of intense work with simulations and data analysis supported by the post-doc positions. since Dec 2012: CNES fellowship (2 yrs) for S. Soldi to work at APC on the data of the 2012 XMM Large Project survey of the Galactic Center. Dr. Thomas Tauris (Bonn University, Max Planck fur Radio-Astronomie, Argelander Inst.). Bower, G., …, Clavel, M. Goldwurm, A., …, Detection of Variability in the Size of Sagittarius A*, 2013, ApJL, submit. Chaty, S., Muñoz Arjonilla, A.J., Dubus, G., Infrared study of H1743-322 in outburst: a radio-quiet microquasar, 2013, A&A, submit. Clavel, M., Terrier, R., Goldwurm, A., Morris, M., Ponti, G., Soldi, S., Trap, G.; The reflection of two past outbursts of Sagittarius A* observed by Chandra during the last decade, 2013, Conf. Proc of IAU 303 Symp. “The Galactic Center: Feeding and Feedback in a Normal Galactic Nucleus”, 30/9-4/10/2013, Santa Fe, NM, USA, submit. de Jong, S., Beckmann, V., Mattana, F.; The non-thermal core of 3C 111, 2012, Proceedings of Science, SISSA, PoS(Extremesky 2011) 076. Soldi, S., Clavel, M., Goldwurm, A., Morris, M., Ponti, G., Terrier, R., Trap, G.; An X-ray survey of the Central Molecular Zone: variability of the Fe Kalpha emission line, 2013, Conf. Proc of IAU 303 Symp. “The Galactic Center: Feeding and Feedback in a Normal Galactic Nucleus”, 30/9-4/10/2013, Santa Fe, NM, USA, submit. Soldi, S., Clavel, M., Goldwurm, A., Ponti, G., Terrier, R., Trap, G., Greiner, J., Prinz, T., Rau, A., Servillat, M.; A new Very Faint X-ray Transient in the Galactic centre, 2013, Conf. Proc of IAU 303 Symp. “The Galactic Center: Feeding and Feedback in a Normal Galactic Nucleus”, 30/9-4/10/2013, Santa Fe, NM, USA, submit.